Success is not always easy to achieve under the shadow of poverty and violence. But occasionally something out of the ordinary occurs, and talent and hard work pays off. 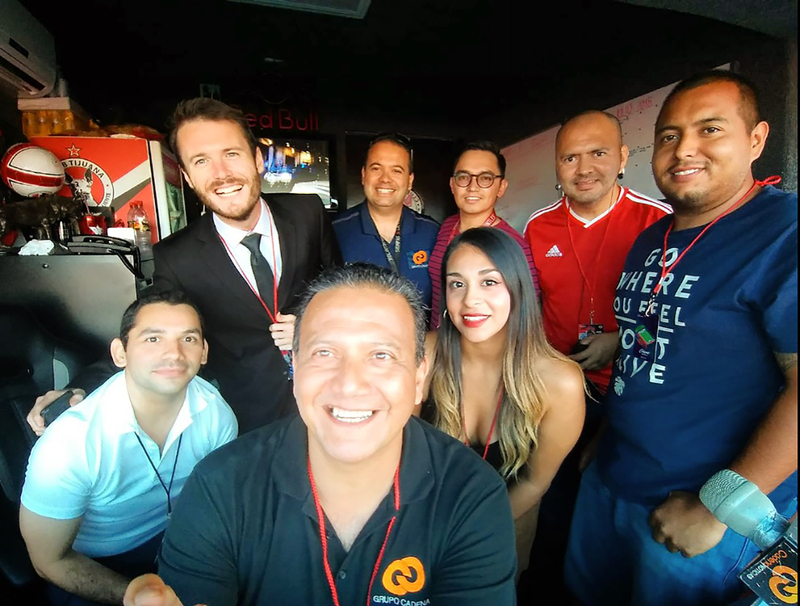 That is the case with Nate Abaurrea, a Watsonville native who broke from his roots to become the English voice of soccer broadcasting in the San Diego-Tijuana metropolitan area. It can be called fútbol, soccer or football; it’s all the same for the 28-year-old who has translated his passion for the game to a career doing play-by-play for the two primary teams in the region, the Xolos de Club Tijuana and the San Diego Sockers. The Xolos are Tijuana’s team in Liga MX, the primary soccer league in Mexico. The Sockers play in the indoor Major Arena Soccer League. 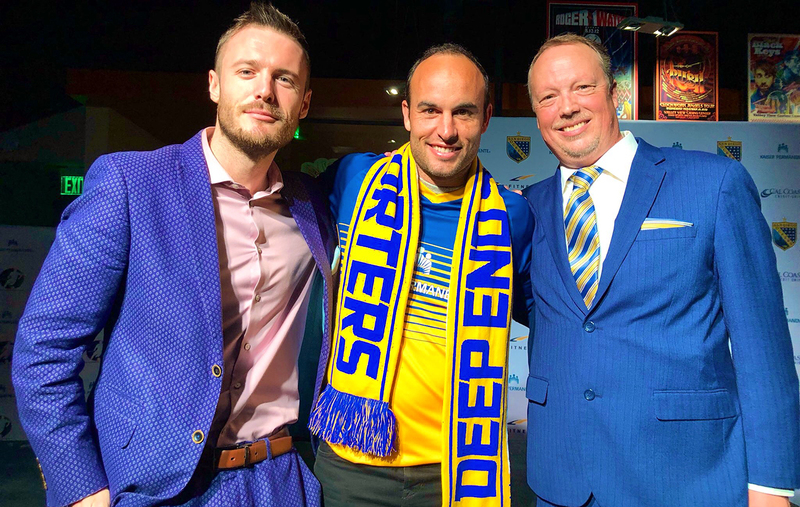 The team recently signed Landon Donovan, an American soccer legend who is coming out of retirement to play for San Diego, where he is scheduled to debut on Feb. 15. 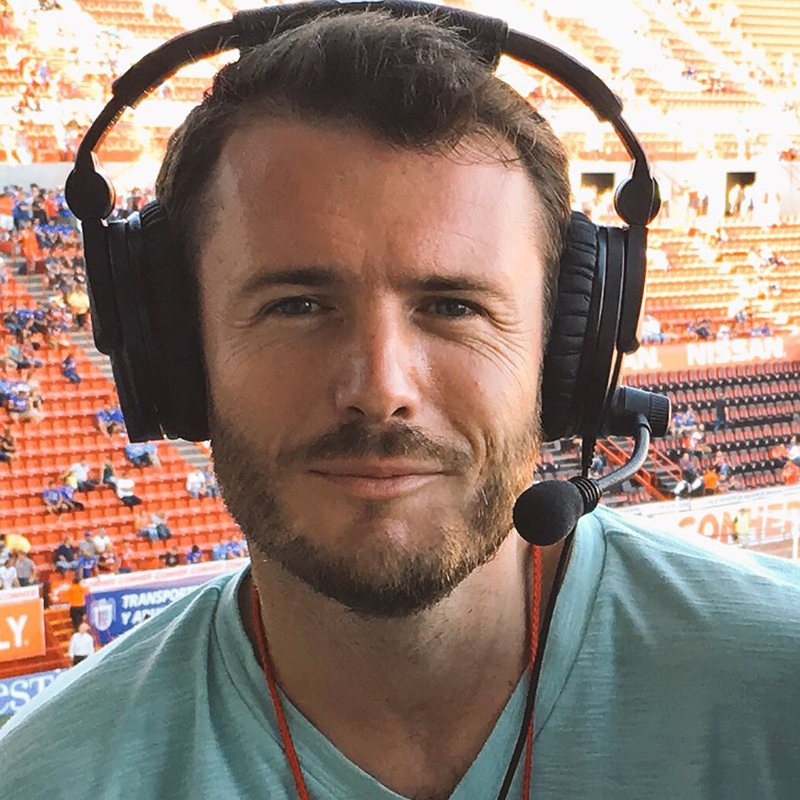 Since 2016, Abaurrea has been doing radio play-by-play for the Xolos and play-by-play and color commentary for televised Sockers matches. Both teams are mid-season this month. During the off season, he has his sights set on possibly covering the Women’s World Cup in France, the Copa America in Brazil and the African Cup of Nations in Egypt. “The game never sleeps, though I try to when I can,” he joked. Abaurrea first got involved in radio at Free Radio Santa Cruz, the infamous pirate station, but his path has given him access to some of the fabled names in fútbol, including Ricardo “el Tuca” Ferreti and Diego Maradona. Nonetheless, he remains grounded in Watsonville. Both the Xolos and the Sockers are in the middle of their seasons, but Abaurrea took time out of his schedule for an email question-and-answer interview with Voices of Monterey Bay. The following is a lightly edited version of that interview. José Romo: Tell me about yourself. What is your background like and how did that define you? Nate Abaurrea: I was born and raised in Watsonville. I grew up with a strong Mexican-American presence in my life from Day 1. I also had quite a few expat English folks around me from a very young age, extended family and what not. What this created was a multicultural upbringing that was entrenched in the world’s game. Call it soccer. Call it fútbol. Call it whatever you want! It became a cornerstone of my existence. It didn’t matter if it was the Premier League, Liga MX, World Cups, local high school teams or playground pick-up. The game followed me wherever I went. Playing. Watching. Worshiping. The mentalities and philosophies of the game that I picked up on the streets of my hometown and inside the houses of my local people gave me a base with which to move forward. I don’t think anyone should be defined by where they come from, and we battled with this mindset a lot growing up. It can put a bit of a chip on your shoulder, and give you that “I’ve always got something to prove” attitude. But if harnessed in the right way, this attitude can actually be a positive thing. I’m forever grateful for Watsonville and the surrounding areas, my nest, the place that raised, nurtured and educated me, and helped me become the person I am today. I wouldn’t trade it for anywhere else in the world. Romo: Did you always think that soccer play-by-play was something you would do? Abaurrea: To put it simply, yes. I always knew soccer play-by-play was a passion of mine, from as young of an age as I can remember. A moment of childhood “fútbol fantasy” wasn’t complete without the play-by-play commentary. I can’t tell you how many times Liverpool won the Premier League on a Watsonville front lawn, or how many times “Abaurrea” scored a stunning golazo (goal) to win a final for whatever Liga MX club I was starring for in that moment on a Monterey Bay dirt patch. When I was 11 years old, I was given an old handheld Sony tape recorder by one of my mom’s old friends. It was rusted a bit on the outside and had the original microcassette inside. To me at that time, it was state of the art. I used to mute the television and do my own broadcast commentaries into that tape recorder, not just for soccer matches, but Major League Baseball games, NFL football, and much more. I even used to do mock radio shows into that tape recorder, myself and other kids in the neighborhood hosting “shows” a la the Central Coast DJ’s we listened to, bantering, doing little skits, introducing songs and everything, before holding the recorder up to speakers playing music to make it sound like we were legit. In Watsonville in the ‘90s and early ‘00s, on free over-the-air TV, you would pick up the local affiliates of Univision, Telemundo, Galavision, Telefutura, and Azteca America. You’d get literally every Mexican top-flight match every weekend and even a few Wednesday nights, for free! All you needed was a television set and a pair of metal sticks, and access to electricity. We used to jokingly call it “Mexican Soccer Season Ticket,” like it was a high-end cable or satellite package. Having access to those games was a godsend. I’m forever grateful for Watsonville and the surrounding areas, my nest, the place that raised, nurtured and educated me, and helped me become the person I am today. Romo: What path did you take to end up where you are today? Who encouraged and inspired you? Abaurrea: A few important junctures along the way: In 2006 I got involved with Free Radio Santa Cruz, the pirate radio station that was raided by the FBI on multiple occasions. I became a member of the Watsonville Brown Berets earlier that year, as school walkouts and direct action came in response to blatantly racist legislation and police brutality. The Berets got me involved with FRSC. I used to take the 71 Metro Bus from Watsonville to the “undisclosed location” studio in Santa Cruz on Saturday nights and co-host 3- to 6-hour radio blocks, learning audio levels, soundboard fades, and technologies old and new, and growing in comfort and confidence on a live radio microphone, all the while getting to play all sorts of badass hip-hop, punk, ska, reggae, rock en Español, and whatever else found its way to the airwaves. All love and praise to DJ Tekolote, Free Radio Santa Cruz, and the Autonomous Chapter of the Watsonville Brown Berets. Resistance is eternal. I went to college at Humboldt State in 2008, doing college radio work as soon as I stepped foot on campus. I feel like when I showed up, I was already riding a wave of momentum as a teenage broadcaster, something that definitely wouldn’t have existed, or at least wouldn’t have felt so fierce, had it not been for the opportunities that the Berets and FRSC presented to me. It was cool how this translated from the music world to the sports world. I never saw any division there. Good radio is good radio. It didn’t matter if I was hosting an oldies show or calling a baseball game. When the mic opens, I want to connect with my audience. All my best teachers over the years have hammered this point home. Without your audience, there’s no show. Value your audience, whether it’s one person or a hundred thousand. Show the same respect. As far as individuals who encouraged and inspired, there is one that immediately comes to mind. Derek Rae, who was America’s voice of the UEFA Champions League on ESPN2 for much of my childhood (Rae’s commentary coming over the old ESPN International Feed, which would get picked up, albeit sparingly, in the United States) and he became an idol of mine. When I was 14, with Liverpool (the team I’ve supported since I was 4 years old) making a true and proper run for the European Cup for the first time in my life, I sent Derek Rae a message through an old ESPN Soccernet page. To my pleasant surprise, Derek not only responded to my message, but wrote back a lengthy reply, and developed a mentor’s correspondence that carries on to this very day. Derek wrote me a letter of recommendation for college, and has offered priceless guidance during some of the most anxiety-stricken periods of my young life and career. Hearing Derek’s voice during the recent 2018 World Cup was almost surreal. I’m like, “That’s the same voice that told me to never feel ashamed about talking into a handheld tape recorder! When I was 14!” It was a bit of a trip. My friendship with Derek Rae is one of the main things that makes me feel obligated to tell young people to reach out to the people they respect. Develop correspondence. See what happens. You never know. The person you look up to might be kind of a jerk. They might be legitimately busy. Or they might be like Derek Rae, and be one of the kindest and most sincere people you’ve ever come across. Shoot your shot. You’ve got nothing to lose. But on the off chance that you do develop a relationship with someone, it’s up to you to make something of it. The topic of “inspiration” wouldn’t be complete without a nod to Jon Miller, the radio voice of the San Francisco Giants. He’s another broadcasting icon of mine, someone from whom I’ve learned so much about the craft just by listening to countless transmissions of Giants games. Some people may not know that in addition to his legendary baseball work, Miller used to call soccer back in the ‘70s and ‘80s, and was even on the call for Pele’s last-ever game, the 1977 NASL Soccer Bowl at Providence Park in Portland, Ore., with Pele’s New York Cosmos taking on the Seattle Sounders. Look that one up on YouTube when you get a chance! Romo: Did you play soccer in high school and/or college? Abaurrea: I never actually played organized soccer past 10 or 11. Playing “club” soccer, the pay-to-play model, was never conducive to the budgets of my single parents. I played pickup street soccer all the time in Watsonville, and even suited up in some men’s league games when I was a teenager. In high school, I was dedicated to baseball. I was a pitcher and outfielder for Watsonville. Had I been at another school, jumping onto the soccer team my senior year is definitely something I would have done. But Watsonville wasn’t a place where you just “joined” the soccer team. That team was and hopefully always will be elite. I was happy just to be friends with some of the players, occasionally crashing practices, and supporting in any way I could. We had some great times with that team. My years at Watsonville coincid(ed) with the founding of Pajaro Valley High School, which cut our talent pool in half, but also gave us a true derby match, a Watsón Clásico if you will. I’ll never forget those first few Wildcatz v. Grizzlies showdowns. Something I’m really grateful for in regards to my soccer upbringing is the opportunities I’ve had to coach high school soccer, opportunities that came pretty much as soon as I moved to Humboldt County. I coached high school soccer teams at Arcata and Eureka High when I was attending HSU. After moving to Redding for radio work after graduation, I coached at Shasta High School for two seasons. To be able to connect with student-athletes at public high schools, to be able to relate to their strengths or weaknesses as players and as young adults … to be able to relate to some of their struggles and do my best to help them improve in any way that I can … it’s something that means the world to me, and there’s nothing more rewarding than seeing your former players do well in the world as they grow as human beings. I miss coaching high school soccer and would love to get back to it someday. Romo: What’s the coolest thing that’s happened to you in your career? Abaurrea: That’s a tough one. There have been so many cool moments and unique experiences, even since moving down here to San Diego and Tijuana in 2016. A moment I shared, as a writer, with Tuca Ferretti while covering the CONCACAF Cup at the Rose Bowl in 2015 will always be something I’ll cherish. He was managing Mexico at the time and had just defeated Jurgen Klinsmann’s U.S. team 3-2 in extra-time, just a wild night in every way imaginable, with 93,000 plus in attendance. Tuca is a notoriously grumpy coach. He thrives in that character. After that match though, he was the sweetest and most talkative man you’d ever met. The day prior, he’d spoken of how grateful he was just to be involved with the Mexican National team. At the very end of the post-game press conference, I asked him what the word gratitude meant to him at that moment. Tuca (famous for screaming curse words at reporters and storming out of press conferences if he even bothers to speak at all) proceeded to speak directly to me for almost three minutes, sounding more like a monk or a priest than an angry football manager. I think the reason why that experience stands out is because I’ve covered Tuca extensively in Liga MX for the last three years, and apart from when he’s on the podium with his Tigres players celebrating a championship, I’ve hardly even seen him smile. I caught him at the perfect moment. Romo: How do you balance and study the two teams you cover? Abaurrea: I owe a lot to this cross-border community, on a multitude of levels. One of my favorite things about covering the San Diego Sockers and the Xolos of Club Tijuana is seeing many of the same individuals at matches of both teams. Thousands of people who love Xolos also love the Sockers, and vise versa. I feel like I’m able to feed off of that love, and enhance my knowledge, passion, and professional quality as a result. More FM, the station that carries our Xolos English broadcasts, is a music station out of Tijuana with transmitters sending our signal all the way south past Ensenada, up north to Oceanside, and out east to Mexicali and Calexico. We’re on the radio in two countries simultaneously. It feels good to bring it all together. A handful of Sockers players are proud Tijuanenses who commute from the Mexican side of the border. Joe Corona, a San Diego/Tijuana native and Xolos fan favorite, attends Sockers games when schedules align. There’s a special sporting bond between Baja California and San Diego County, and to be brutally honest, the Sockers and Xolos are the only teams to ever bring actual championship glory to this community. They are both integral parts of the soccer culture of the area I now call home. Balancing the two gigs can be tough, but it’s also a blessing. Romo: How do you prepare for broadcasts? Do you have a ritual or some routine? Abaurrea: Broadcast prep should start as early as possible. As soon as you know your assignment, you should start preparing. One of the biggest challenges for commentators is condensing all of the information you might gather down to what really matters. Every commentator has their own system. I like to boil all of my research and preparation down to about two sheets of paper by the time the broadcast begins. I’ve seen good broadcasters who use remarkably minimal notes. I’ve seen good broadcasters who would have binders of notes and spatter the walls and windows of their booth with relevant local newspaper clippings and reference them on-air with quotes highlighted to read aloud throughout the night. You’ve gotta do what works for you. I’m 28 years old, and I like to think I was preparing for broadcasts from the time I was in the womb. Romo: What is the biggest goal for your career? Abaurrea: My biggest goal is to someday have people talking about me the way I talk about Derek Rae or Jon Miller, or the way other people talk about their favorite broadcasters. I want to make a positive and lasting impact, as a broadcaster, as a writer, and as a person. It’s a goal for which I will always strive. Romo: How has social media and online broadcasting shaped your career? Abaurrea: Social media is a great vehicle for connecting with people from all around the world. If you use it in the right ways, it can be a wonderful thing as an artist. Twitter and Instagram in particular serve as great platforms to display my work and get my voice out. You have to not let it consume you though, your social media “image.” This can be tough in a culture built on shares and follow counts. It’s a balance. I’m still working on finding that balance every day. 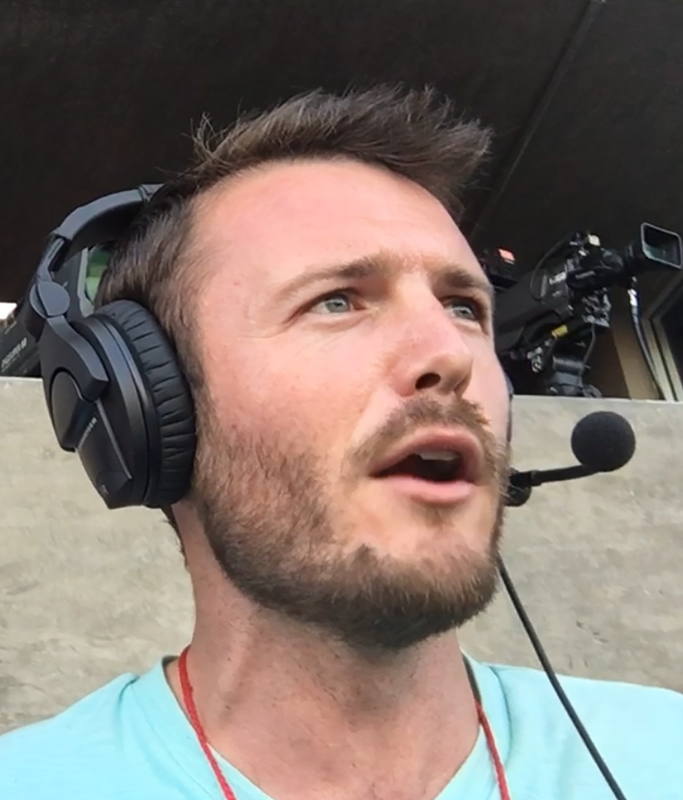 I think technological developments in soccer have definitely made a positive impact on my work as a LIVE match commentator, whether I’m doing play-by-play or color. However, I am still a bit weary of the way VAR (Video Assistant Referee) is being applied to the game itself. The 2018 World Cup Final was flipped on its head due to what I and millions of others felt was a dubious penalty call, which was given only because of video review. Referees in Liga MX has been quite liberally using VAR this season and it’s felt absolutely insane at times. I’m hopeful the system gains some fluidity, because at the end of the day, I think most of us just want the correct call to be made. Romo: When in front of the microphone, how do you leave your jersey behind and allow your love for the game to speak for itself? Abaurrea: This is a brilliant question, and one that really strikes a chord with me. In my opinion, we should all be fans first. Yes, we segue into different sub-sects of the game we love. But surely almost every player, coach, trainer, broadcaster, writer, etc. was a fan before anything else. We all had childhoods, for God’s sake. I don’t think we should ever stray too far away from what made us fall in love in the first place. It’s about being a fan of the game itself, and everything it gives to us on a daily basis. Within that, we have teams, players and personalities we adore. As long as it doesn’t negatively impact your work or create annoying levels of partisanship and bias, I don’t think there’s anything wrong with people knowing your true allegiance. For example, when I’m calling a Xolos game, I have no qualms in saying that I want Xolos to score and I want Xolos to win. Not only is it good for ratings and interest, but I also just love the club and want to see them succeed. I’d definitely call myself a Xolos fan. But when Andre Pierre Gignac scores a stunning golazo for Tigres against Xolos, as he did on opening night just a few weeks ago, rest assured I’m gonna be calling it with the same passion and respect I’d give to a Xolos match-winner. That goes for any goal, any player, any team, etc. etc. They are all part of the show. I feel like being a fan first makes me a better broadcaster. I know a lot of people who would disagree with this mindset. That’s okay. Again, you’ve gotta do what works for you. Romo: The local soccer programs (high schools and academies) have been highlighted for their great job in the past. What do you think has been done right with the youth? Is there anything that should improve? Abaurrea: Soccer is part of the heartbeat of the Central Coast. Those high-level teams all around the 831 have created cultures that will be passed on for generations. That’s something that takes decades to build, and it’s so important for people to carry on those legacies, especially in places like Salinas and Watsonville, where soccer is a beacon of hope and promise for young people when it feels like all the odds are stacked against them. We need to value these cultures, these microclimates of fútbol that exist in the places we call home. They are powerful things. We could get into all sorts of different conversations on this topic, but I think it’s vital to think hyper-locally, and do what we all can do on a neighborhood-to-neighborhood level to keep these Central Coast cultures alive and well, and truly grow the game. Romo: In one of your blog posts, you mention that athletes at a high school level usually diminish their desire for a college education and aim low in their dream universities. What would you say needs to be done to influence a greater academic desire among these athletes? Abaurrea: That’s difficult to answer in any kind of succinct form. To put it simply, in regards to where we are from on the Central Coast, it’s about the same soccer culture we were discussing before. It’s about making education a part of that soccer culture, one neighborhood, one kid, one classroom, one school at a time. The desire has to come from within the individual student-athletes themselves, but as educators, coaches, mentors and even friends and family members of student-athletes, we can all do our part to encourage excellence in academics, and more so help to create an enjoyment of education, especially with communications and the arts. This is not a shift or change that can happen overnight. It could take years, decades, generations … but it can start today. Let’s create change, together. Saludos a todos. Hasta la próxima. Jose is a junior at Everett Alvarez HIgh School and does play-by-play for Alisal High broadcasts on MCAET TV. He also volunteers at Salinas Valley Memorial Hospital and is a 2017 graduate of the Monterey County Youth Media Project.